Prince Harry joined actress Meghan Markle during the closing ceremonies of the Invictus Games Saturday, giving his grinning girlfriend a kiss on the cheek as Bruce Springsteen performed. Markle and her mother Doria Radlan watched the closing ceremonies from a luxury box at the Air Canada Centre in Toronto. 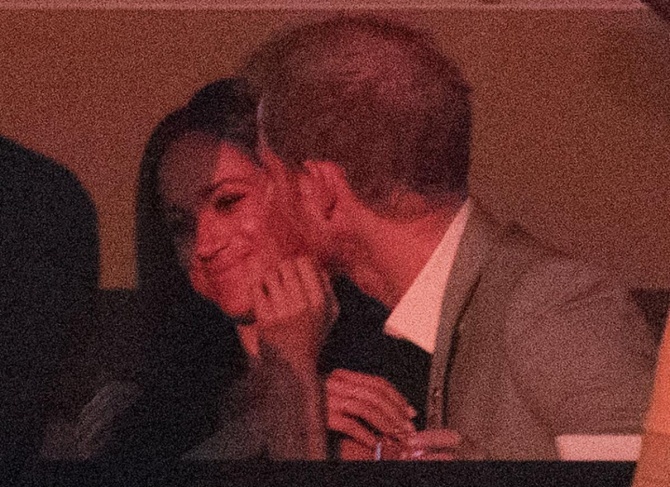 Prince Harry kisses Meghan Markle on the cheek during the Invictus Games closing ceremonies. The ceremony concluded seven days of inspirational athletic performances by wounded veterans.